1. Pallas septile Pluto; Pluto trine Jupiter (ruler of Pallas). This is the same configuration as the three recent Ramadan terror attacks, except that the Moon and Venus have moved into different aspects. 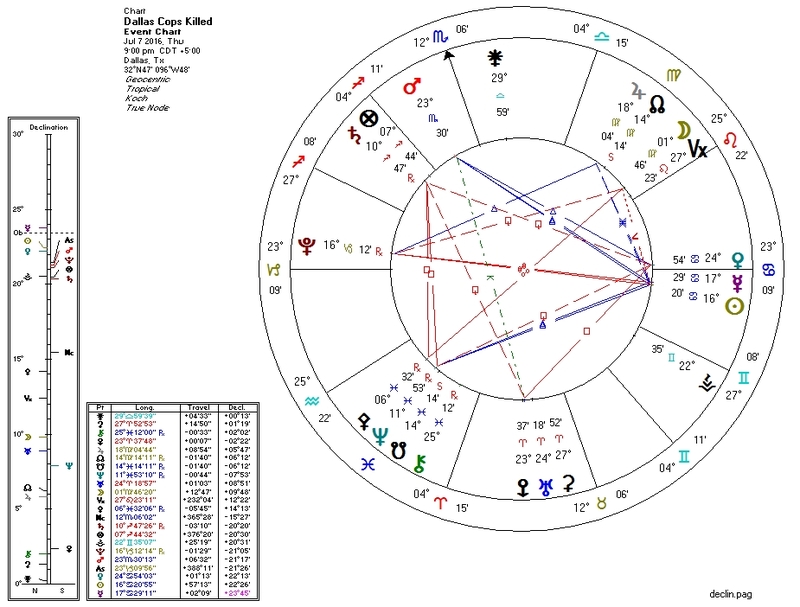 For "Black Lives Matter" events, there is a tendency for the concurrent astrology to display a combination of Pluto (for death/power), Jupiter (populism/ideology), and Cancer/Moon/Fourth-House (race, among other things). Here we have the Sun in Cancer opposite Pluto, semisquare Moon, and sextile Jupiter. It is a fatal error in non-libertarian thinking to assume that all members of a category (black people, cops) are fully representative of the worst perceived features of that category.